As we have mentioned in our blogs before, financial advising is not the same as it used to be. While a lot has changed since the 90’s, many financial advisors are still using the marketing strategies that were popular during that time. These strategies may have been effective back then, but today, many advisors who follow these old techniques are likely the ones who are having a difficult time bringing in new clients. In addition, there are some financial planners out there who prefer to avoid marketing techniques and focus growing their business by client referrals. While some financial advisors can still find success using these strategies, they are becoming more and more outdated. Gone are the days of boring newspaper advertisements. Advisors need to be able to resonate with the new generations of clients who are in need of a financial advisor. When it comes to Gen X and Gen Y, purchasing advertising or email lists isn’t going to get the job done. Unlike baby boomers, the original financial planning group, these two generations of clients are more skeptical of advisors and require a much different approach. Attempting to buy their attention will not be effective, instead, financial advisors and planners need to modernize their marketing approach and understand what content marketing is and why it is essential to a successful practice. The goal of content marketing is to provide your clients and niche audience with content they will be interested in. Ideally, content marketing can get better results and bring in more prospects than the traditional ways of investment marketing, and it can be executed without a budget. All it takes is time and some knowledge and advisors could be reaping the benefits of content marketing. Content marketing can be very beneficial for financial advisors and planners. This form of inbound marketing allows advisors to attract their ideal prospects without having to pay for their attention. This can be beneficial for those advisors or firms that manage the assets of high net-worth individuals and institutional investors. In content marketing, while there are limited resources advisors have the ability to market themselves, their practice, and their services without having to budget or spend money. Financial advisors who utilize content marketing are able to naturally create a strong platform to highlight themselves and their services where it matters most with the next generation of clientele: online. These generations are much more likely to use the internet to search for the advising services they need. In most cases, prospects will turn to search engines, like Google or Bing, and search the name of specific advisor or firm. This generation of prospects are more likely to favor advisors who have a well-designed website, a blog that is updated consistently with relevant and helpful information, and are active on social platforms. Advisors who have these important features will be better positioned as experts in the eyes of those who are searching for their services. In addition to building credibility and expertise, content marketing is an effective way for advisors to develop trust and beneficial relationships with their ideal target market. Unfortunately, both Gen X and Gen Y are generations that tend to be skeptical of traditional advising services. However, advisors who provide content that engages and educates the readers can have a huge impact on those who are in need of help with their finances but aren’t quite sure where to get started. As you can see, content marketing can be extremely beneficial for financial advisors. Those advisors who steer clear of the “old ways” of financial advising marketing and work towards developing a content marketing are likely to have more success in reaching the next generation clients. For financial advisors that are new to content marketing and starting from scratch, it is best to first develop a plan. Check out a few simple steps advisors can follow to create their own content marketing strategy for their practice or firm. When creating a content marketing strategy, the first step is for advisors to identify their goals and objectives. Without goals and objectives, it will not only make it difficult to execute a plan, it will be more of a challenge for advisors to end up where they want to be, either short-term or long-term. Advisors already have a lot to do during their workday, and trying to produce every form of content that is available is a waste of time and might not be as effective. Advisors need to select and focus on forms of content that they enjoy and excel at, and stick to them. For example, if an advisor is more active in social media and is experiencing some great interactions and results, then it’s not necessary for them to alter their focus and time away in order to begin a webinar. To get results, advisors must decide what forms of content they enjoy and are good at, and stick to those specific forms. Once advisors establish the framework of their content marketing strategy, its time for them to execute their plan. Many advisors find success by selecting a schedule to release their created content while being consistent in the creation of fresh, new content. If blogging once per week is included in an advisors content marketing strategy, then they should be publishing a blog each and every week. Of course, creating content is essential to a content marketing strategy. However, a strategy may not be effective without any promotion. By promoting the created content, advisors will likely see more results and leads. Check out a few channels that financial advisors can use to promote the content they create. The only way for advisors to determine if their content marketing strategy is effective is to track and measure the progress and results of their content marketing strategy. By tracking and monitoring their strategy, advisors will have a better understanding of what is and is not working, what can change, and how their strategy can improve. We get it, many advisors don’t have time for content marketing, let alone developing an effective strategy. With portfolio management, client meetings and interactions, and other daily tasks of financial advisors, it may be difficult for some advisors to take out a block of time to focus on content marketing. 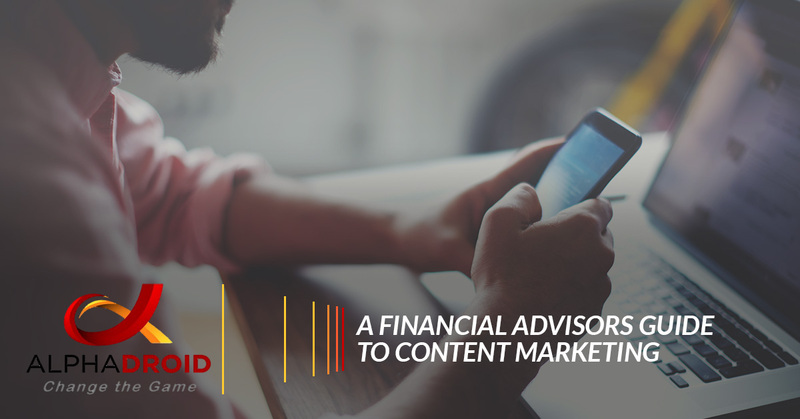 However, content marketing is essential for advisors to have success in today’s market. Advisors can quickly create more time in their day to allow for implementing a content marketing strategy by utilizing asset allocation software, and there is not a better asset allocation software than AlphaDroid! AlphaDroid software handles a large portion of portfolio management, which will allow financial advisors to focus more on the implementation of their content marketing strategy. AlphaDroid provides financial planners and advisors with a precise and disciplined approach to productively catch the best days in the market while ignoring the worst. Using AlphaDroid can allow advisors to spend more time focusing on growing their business by content marketing, networking with clients, and more! If you are an advisor and want to learn more about how AlphaDroid can help you, contact us!